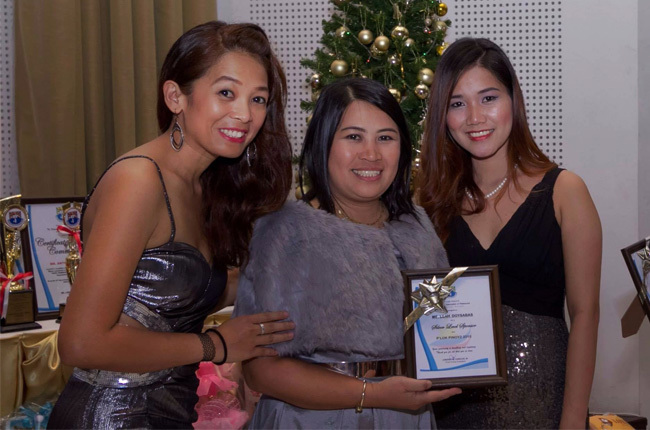 P’lok Pinoyz, the Filipino organization of Phitsanulok, Thailand hailed their very first Outstanding member recently, December 19, 2015 on the occasion of the community’s annual Christmas Ball at Wangchan Riverview Hotel. 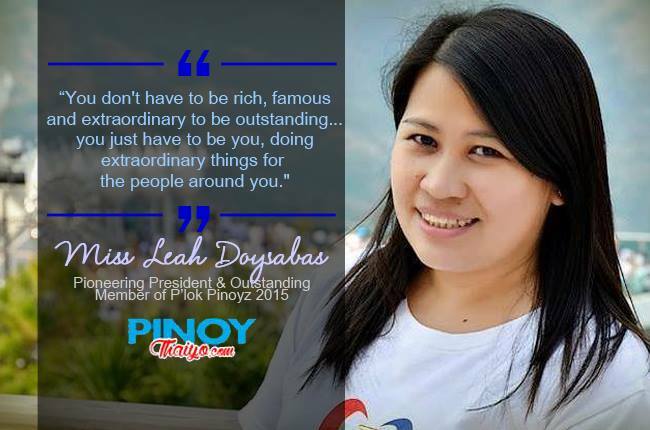 Miss Leah Doysabas, the pioneering president of P’lok Pinoyz was chosen amongst the poll of nominees for her unparalleled contribution and her dedicated service to the Filipino community in the Phitsanulok and its nearby provinces. Doysabas has a long history being an OFW since her arrival in Thailand in July 26, 2003. After sometime in Bangkok, she was hired to teach Science in Chalermkwansatree School, one of the top government schools in Phitsanulok for girls, in April 2004. 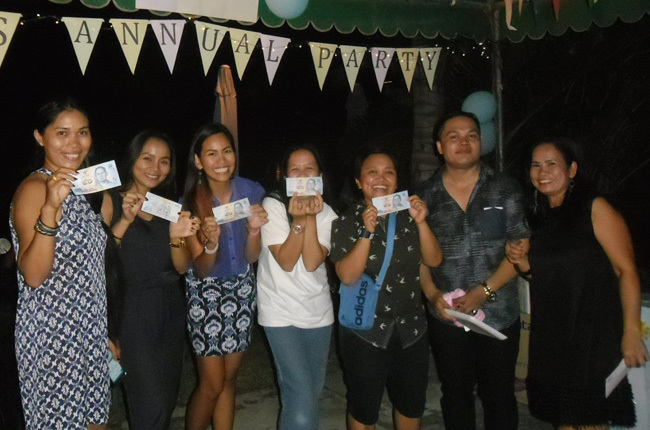 Since then, she has made Phitsanulok her second home away from home organizing different activities for the Filipinos during special occasions and holidays even before the P’lok Pinoyz was formally organized. 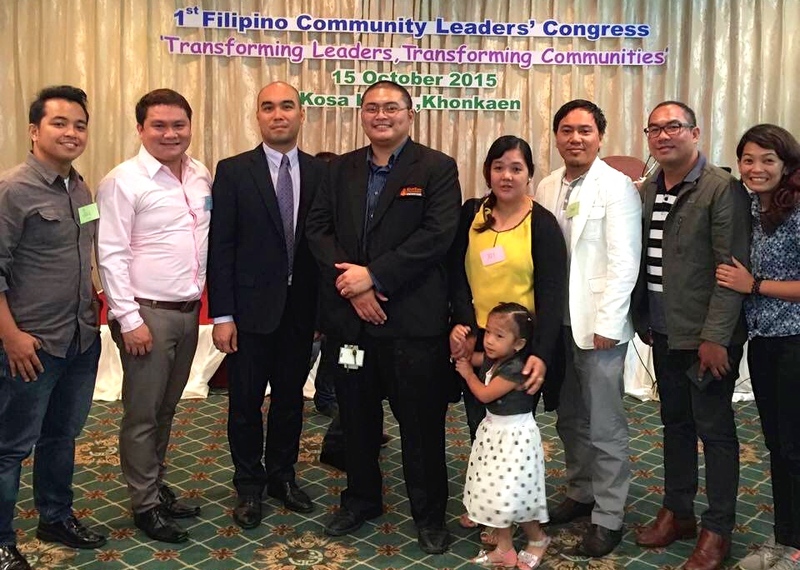 In October 2010, the Filipino organization of Phitsanulok was properly established with the election of the first set of P’lok Pinoyz Council with Leah Doysabas heading the community. 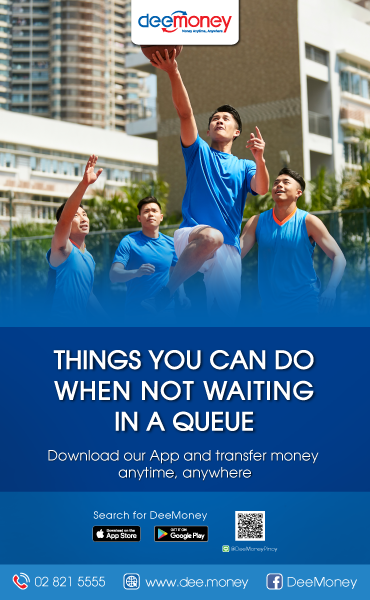 For two years, the pioneering set of officers was successful in spearheading different activities such as Sports Events, Independence Day Commemoration, Career Development Seminars, Outreach Activities and many others. 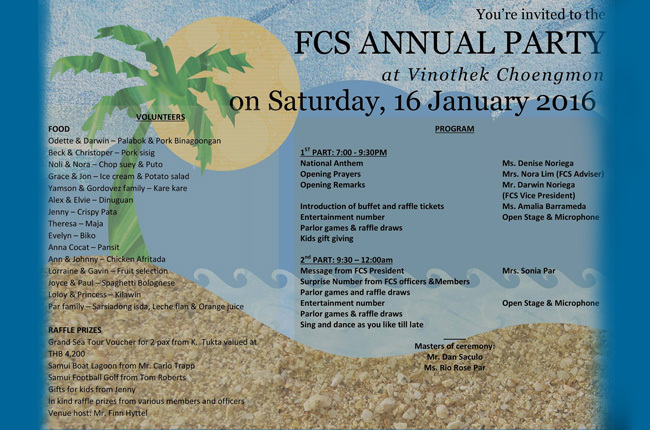 Doysabas is also an active leader and member of Saint Nicholas Church Foreign Community (SNCFC), an organization of foreign Roman Catholic members in Phitsanulok, which also holds regular church and other civic-related activities. At work, Doysabas also paved the way for other Filipino teachers to be hired in Chalermkwansatree School. In an interview with a leading Philippine daily, she revealed that the school administrators who have once put “No Filipino Applicants” in their job advertisements have decided to hire more Filipino teachers after realizing how dedicated and hardworking Filipino teachers are based on her performance. 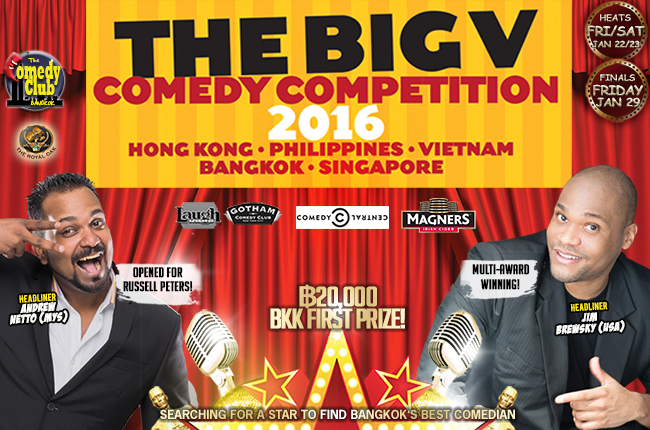 In 2014, she told Pinoy Weekly, “Filipinos are known for outstanding and commendable characters and work ethics. Filipino teachers have gained respect not just from Thais but from other nationalities as well. We may be discriminated at first because we are from a Third World country; our accent they say is funny and we don’t have fair skin and blonde hair. But once they get to know us, Thais will respect, love, treasure and keep us for long”. “I don’t know what extraordinary thing I did for P’lok Pinoyz…but I guess, my being the “founding president” is to be blamed. But I would not have done it without the help of the rest of the first batch of officers, commissioners and members who believed in me. As I always say, there are two kinds of leaders…a born leader and the one that’s made. And I would say I am the latter type of leader. I became a leader because of P’lok Pinoyz. This organization made me believe that I could. You made me…and for that, I thank you! Thank you for this award…I am humbled!” says Doysabas. The Outstanding P’lok Pinoy is selected based on three main criteria: Character, Leadership and Service. 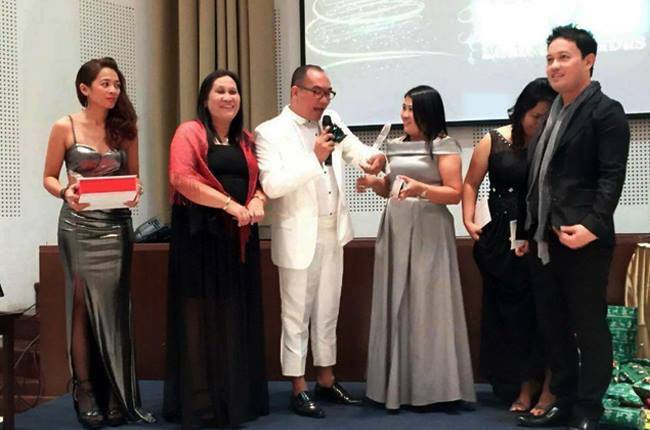 The award aims to highlight the outstanding contribution of the many ordinary Filipinos in Phitsanulok and Thailand in general thus the tagline: Outstanding P’lok Pinoy: Ordinary Filipino, making a difference in Thailand. 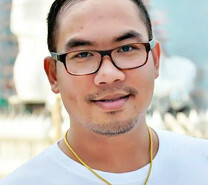 Lorenzo Caballes, Jr. is a teacher by profession and a part-time blogger. He writes for lonerzone.com and TripZone. 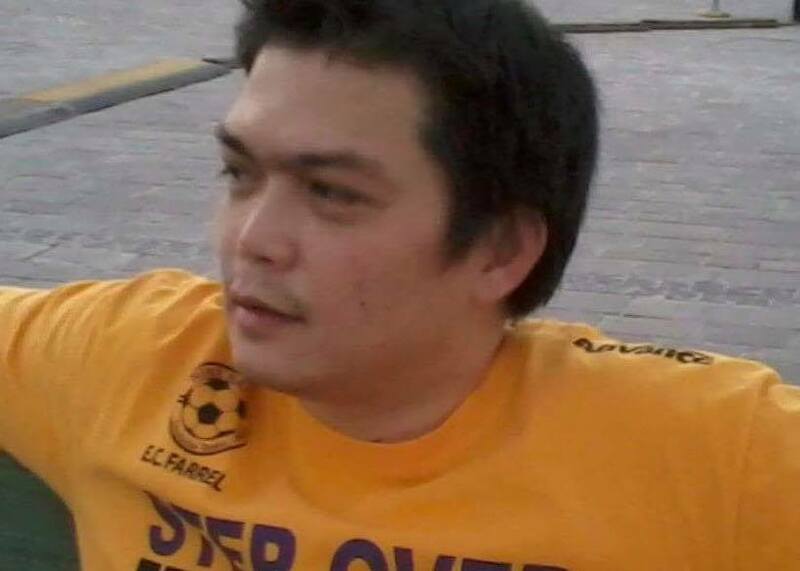 He is also the current president of P’lok Pinoyz, the organization of Filipinos in Phitsanulok, Thailand.